Home Carlo Goldoni is a home particularly created for lovers and married couples. This home is located 80 meters from Piazza San Marco, in the highest value storical artistic and architectural heart of this famous town; the most beautyfull town in the world. It was conceived and planned from Architect Michelangelo Eremita, it has high value finishes and high quality materials. Casa Carlo Goldoni is a two levels home. You have only two steps to get in. There is no risk during the high tide because the ground floor is at safety level. These fact make Home Carlo Goldoni very comfortable. The living-room, the kitchen and two single beds are at the ground-floor. The bath-room and the bed-room are at the first floor. refrigerant, freezing, gas cooker, washbasin, dishwasher, convection oven, washing machine, two televisions with digital receiver, air conditioning, hydromassage Jacuzzi, safe-deposit box, emergency light, adsl wi-fi, independent heating. The living-room welcomes guests with four pit-stalls and a big table with three chairs and a three seats bench. At first floor there is a wide bed-room with wardrobe, chest of drawers, writing desk and armchair. There are wood floors and carrara’s marble floors, and wooden beam ceilings. You can reach Home Carlo Goldoni from Piazzale Roma and Rail Station by boatbus ACTV number 2 direction Rialto “San Marco” stop. You can reach Home Casa Carlo Goldoni from Airport boat line Alilaguna Red Bleu or Gold stop San Marco. You can reach Home Casa Carlo Goldoni from Piazza San Marco simply finding Calle del Cavalletto and straight on to Campo San Gallo, there you will find a great gate that leads to Corte S. Zorzi. Corte San Zorzi defends the Home Carlo Goldoni’s privacy and it allows to stay outdoors away from the tourists crowd. Home Carlo Goldoni is far away from the daily traffic jam, it is quiet and silent like a country-seat. Windows overlook Corte San Zorzi and are in bright sunshine during all the morning until early afternoon. The great main door at the entrance marks it outs. It is exclusive and it opened in the centre of the Corte San Zorzi. You can get the ACTV boat-bus at “San Marco” stop 200 meters long from Home Casa Carlo Goldoni then in 15 minutes you can get Lido of Venezia. There you easily can get Des Bains and Excelsior’s beaches or make a visit to the naturalistic area of Alberoni. Home Carlo Goldoni has this illustrious name because there Carlo Goldoni ( 1707 – 1793 ) lived. He was a illustrious venetian poet and dramatist. He stayed there from September 1748 and June 1760. I am an art dealer. I came here in Venice in 1992 to study ecnonomics and I fell in love with this town. I buoght an ancient warehouse and I transformed it in a great art gallery. Near there was also this apartment. I lived there for 10 years then I put it at tourists disposal. Nowadays I live here in Venice. Hope to have a lot of travelers who like my Home Carlo Goldoni both for the aspect and his history. My best wishes. venice is the most beautyfull town in the world. All the people would like to get in Venice at least once in their life. This home is specially dedicated to people who really love Venice and his history. 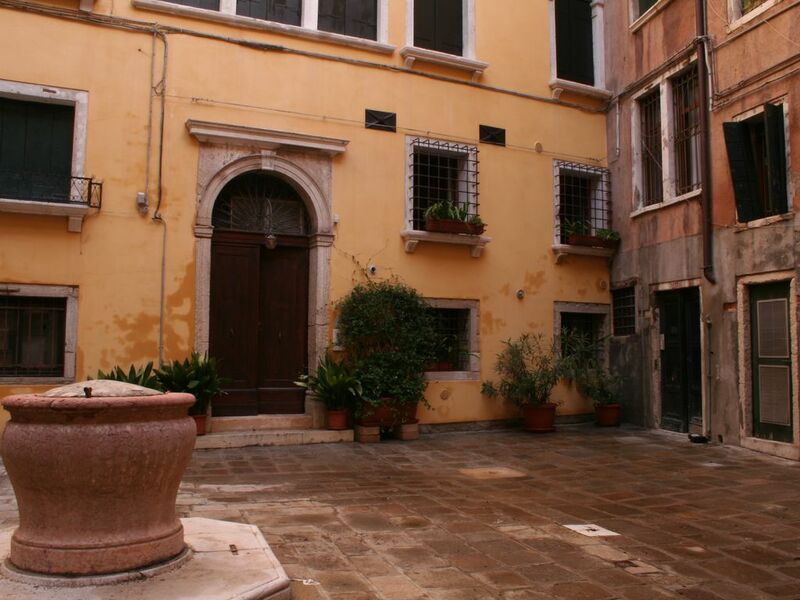 The Home Carlo Goldoni is next to Piazza San Marco the most beautyfull place in Venezia. The home is quiet and private, full of comforts. The best place to live in Venezia. art design furnitures, artistic embellishments, mosaics, painting, home of Carlo Goldoni illustrious venetian poet and dramatist. You know what they say, "Location, Location, Location!". This place has it. It is right off St Mark's Square. In fact, on one day when it rained, we walked underneath the covered walkway that surrounds St Mark's Square, and it kept us out of the rain for 9/10 of the walk between St Mark's Basicilla and our apartment. It is only steps to a Gondola station where you can take a ride. Restaurants are also extremely close. There is a major walkway / thoroughfare between St Marks and the Rialto Bridge. Shopping and restaurants are on it. It is only one one building away! There is not a lot of kitchen equipment in the way of utensils, but the basics are there. We didn't plan to cook, anyway. :) Since the place is very clean, and the location is perfect, I recommend this apartment and would stay there again. Beautiful apartment steps away from San Marco. Owner was very accommodating when it took us extra 30 minutes to pack after the scheduled checkout time. He also let us to store our bags for few more hours. Comfort and luxury in Venice. We loved staying here during our visit to Venice. It was conveniently close to Piazza San Marco which made it easy to get lost at will, because we could always find our way home again. The flat was very comfortable and a nice home base. We would definitely stay here again! Hello! I hope so, I love my guests as I love Venezia! My husband and I stayed here with our 18 month old in October 2011, and we could not have had a better stay! The apartment is centrally located but tucked away from the crowds, perfect for a quiet night's rest after visiting the city. We loved the decor and custom pieces throughout the apartment. The jacuzzi was awesome, as most places we've stayed in Europe only have a shower or miniature tub. The apartment was very clean, well kept and extremely secure. It's just as the pictures show it and more. This was our favourite apartment in Italy, thank you for a wonderful stay! Hello, many thanks for your review, hope to welcome again such as good people who loves Venezia. Ciao! This apartment is fantastic! It is centrally located extremely close to lots of sights and crowds but it is tucked away within a quiet courtyard so you enjoy the peace and privacy of another world. Besides being comfortable and relaxing, it is uniquely decorated with original works of art on the walls, furniture, table, even the floor. Nicola was very responsive, helpful and a nice trustworthy guy. Everything was clean and well maintained and we were always able to reach Nicola when necessary. It was just a joy to come home to this apartment after exploring Venice and it is so well located that we could stop by in the middle of the day to rest and then set out again. There are shops, restaurants and excellent gelato just steps away. many thanks. Venezia is my passion and I like people who loves Venezia and respects it. I like to offer the real Venezia at my guests. Hope to offer always a good service. :) Ciao! !